LeBron James scored 32 points and grabbed 13 rebounds, Dwayne Wade scored 10 of his 22 points in the fourth quarter and the Heat beat the Boston Celtics 93-79 on Monday in Game 1 of the Eastern Conference finals. Shane Battier, playing in the conference finals for the first time, had 10 points and 10 rebounds for the Heat, who wasted an early 11-point first-half lead, then gave up 35 second-quarter points before running away to break a halftime tie,Â getting going with a 9-2 run early in the third. Game 2 is on Wednesday in Miami. 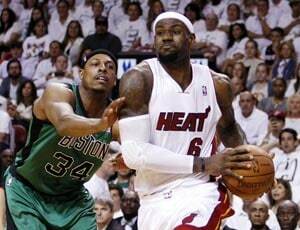 It's the third straight year the Heat and Celtics have met in the playoffs, and the third straight year James has seen his postseason path go through Boston - the first of those matchups coming in 2010 in his final run with Cleveland. He had 13 points in the first quarter - two more than the entire Celtics roster - and Miami ran out to a 21-11 lead after the opening period. Garnett made three of his four shots in the quarter, while everyone else in Boston green was 2 for 16 from the floor. And the Celtics' comeback happened even while they got hit with three technical fouls in the second quarter, plus Allen missing four first-half free throws - matching his career-worst for an entire game. With the game tied at 50, Rondo missed three shots in a 31-second span early in the third, the last of those getting blocked by Battier,Â who hit a 3-pointer 11 seconds later. It started a 9-2 Miami burst, including a touchdown pass from Wade to James, Wade grabbed the rebound of a miss by Pierce, spun and delivered a 90-foot pass to the reigning MVP,Â for an easy score. Pierce was 5 for 18. Rondo shot 8 of 20. Ray Allen was 1 for 7 from the floor and 3 for 7 from the foul line,Â missing four free throws for just the third time in his 1,270 career regular-season and playoff games.